Tuesday's season opening performance did not exactly go as planned for the Fairfield Ludlowe girls soccer team. The Falcons fell behind by three in the second half, before losing 3-1 to Staples at Loeffler Field in Westport. Three different Wreckers-- Abbey Lake, Adele Mackey and Abby Fagan-- tallied goals, Callie Ahlgrim added an assist as Staples won its first game of the season. Emily Matis scored the lone goal for the Falcons. 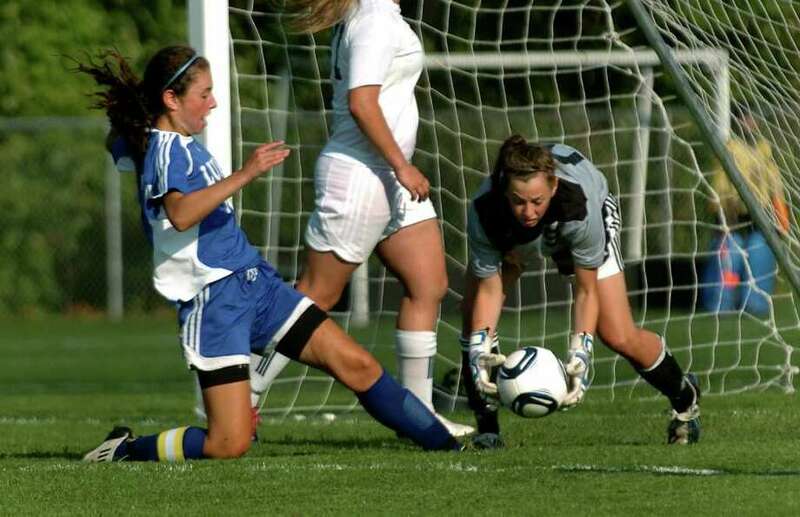 Goalkeeper Katherine Mahder stopped eight shots for Ludlowe. The Falcons were highly touted after consecutive trips to the Class LL semifinals, but sputtered offensively and defensively in the opener. The Wreckers controlled the offensive action, outshooting Ludlowe 23-20. "If the kids were honest, they'd say Staples outplayed us," Ludlowe head coach Tony Samuelian said. "There's no doubt about it." Staples' initial tally came from outside the box, when Fagan booted a lobbing, long ball that sailed over Mahder's head and under the cross bar to put Staples up 1-0 in the eighth minute. "It's got to be stopped," Samuelian said of the shot. "It was about 40 yards out." Lake could have scored at least four goals, but hit the crossbar once, and was twice thwarted by the defensive efforts of Ludlowe junior defender Ally Doyle. Doyle's dive in the 13th minute pulled the ball off the goal line and then her header kept Lake off the board again later in the contest. But Lake finally potted her first of the year when, on a run, Ahlgrim crossed the ball into the box that Lake headed passed Mahder, putting the Wreckers up 2-0. "We were disorganized, man-marking wise," Samuelian said. "That's what we always work on." Mackey's goal came 10 minutes later, in the 56th minute, when she took the ball from the end line and served it over Mahder's head and in the goal to make the game 3-0. Matis cut the Wreckers' advantage to two, when off a throw in from Katie Coyle, she crossed to the middle and flipped a left footed shot over Staples' goalkeeper Jessie Ambrose. "We've got a lot to work on," Samuelian said.